Recover complete data from highly corrupted .wab file. Quickly recover permanently deleted contacts from WAB file. Export the recovered data in PST, WAB, vCard & CSV format. Scan and recover damaged contacts .wab data with all attributes. No file size limit for outlook express address book contacts data. Search required data from recovered contacts list & save time. 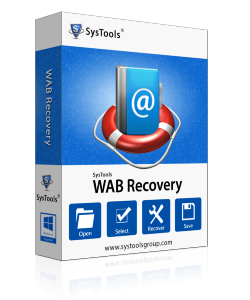 Software supports all windows operating system for WAB recovery. MS Outlook should be installed before exporting WAB contact into PST. Buy the full version to deploy all features of the application. Order complete software online with our secure payment gateway. We provide 30 days money back guarantee. This screenshot is showing the WAB file of Outlook Express, which is an ordinary disk file, gets corrupted due to reasons like malware infection, hardware malfunctioning, human errors, etc. When it gets corrupted, the entire database stored in it becomes unusable and the need to do Windows Address Book Recovery occurs. Mostly we have come across the cases of Windows Address Book corruption due to hardware misfunctioning but, cases like virus attacks, human mistakes, etc also remain good in percentage. You can say 50% cases are of hardware misfunctioning and rest 50% are of virus attacks, human errors and other things. In all these cases, the tool, which can perform Windows Address Book Recovery successfully is, WAB Recovery. The error mentioned in this screenshot, is an issue of corruption in Outlook Express Address Book file. It occurs when an Outlook Express user installs several updates from Microsoft Â® in a day. This issue can get resolved with our WAB Repair tool, which is one of the best tools to repair Outlook Express WAB file. Windows Address Book Recovery in WAB/PST/CSV File Formats is Possible! See, if you want to use your Outlook Express address book in MS Outlook after recovery then, you can recover Outlook Express WAB file as healthy PST file with our tool to repair WAB files. If you want to use your address book back in Outlook Express after Windows Address Book Recovery process then, you recover WAB files as healthy WAB files with our Outlook Express Address Book Repair tool. If you want to use the contacts of your Outlook Express Address book in any other email client or Excel application after recovery then, you can recover corrupt WAB file as healthy CSV file with our Windows Address Book Recovery tool. CSV file format can get accessed in Excel application and almost every email client. One day I was unable to access windows address book data. Because the .wab file got corrupted then, I searched on internet for WAB Recovery Software. The software worked well and easily recovered the complete data. Paying great thank to the developer team. I have a .wab file which contains approx 8000 contacts. I don’t know why, but I am not able to view the data. Then I concerned with an expert and he suggested me to Windows Address Book Data Recovery Software. I used it and viewed complete data. Many thanks to support team. I Successfully recovered complete data from damaged .wab file. And tool support to various file format to save the resultant file like vCard, CSV, PST and WAB. I exported the recovered data into .csv format. The support team helped me to execute the software. I Successfully recovered permanently deleted windows address book data by using WAB Recovery Software. Also the software enables me to search for required file from the complete resultant file. This advance search saved my time. Thanks for giving this tool. Does WAB Recovery Tool Support windows 10 Operating System? Yes, the software is compatible with all windows version. You can easily install it on your system. Does the Windows Address Book Recovery Software have any size limit? No, You can repair or recover any size .wab file. The software is tested up to 10,000 contacts. Does the software support bulk conversion of lotus notes to outlook? Yes, the WAB Recovery Software supports bulk conversion of address book contacts. Dose the software allow me to recover contacts from multiple file simultaneously? No, the software allow users to recover or repair only single .wab file at a time. Does this WAB Contact Recovery Software allow me to preview the contacts? Yes, Software enables users to preview the contact details and then perform export option.